PACIFICA (AP) — Crews have removed an 82-foot yacht from a Northern California beach after authorities say three people stole it, stocked it with pizza and beer, and then ran it aground. 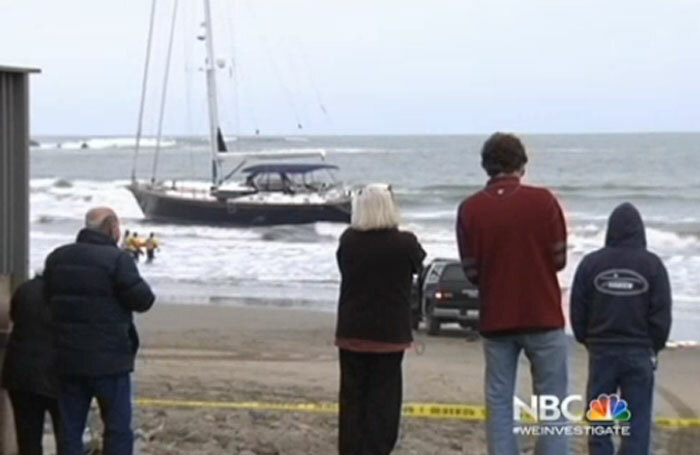 KGO-TV reported the luxury sailboat Darling was pulled from the sand early March 5 at Pacifica State Beach, where it had been stuck for nearly a day. Pacifica police arrested 63-year-old Leslie Gardner, 54-year-old Dario Mira and 56-year-old Lisa Modawell on suspicion of grand theft and conspiracy. The three were being held at press time in the San Mateo County jail. Rescue crews responded to reports of the boat being run aground early March 4. After television news broadcasts of the grounding aired that day, the boat’s owner called police to report it stolen, Sausalito police Sgt. Bill Fraass told the San Francisco Chronicle. “We do have thefts of vessels throughout the area, but the theft of a vessel of this size is uncommon,” Fraass said. The sailboat was trapped in shallow water at low tide and unable to get back out to sea. A few wetsuit-clad surfers paddled out in the frigid water near the grounded vessel as its hull was battered by 4- to 5-foot waves. Police with guns drawn and Coast Guard personnel surrounded the boat and managed to get the trio of occupants off the vessel without any injuries. The boat’s owner was called out to work with authorities to have Darling removed from the beach before it could be destroyed by the strong surf. The boat suffered damage to its rudder and keel, and it is being repaired. The Coast Guard said there were no signs of pollution from the boat.